2. What is difference between TRUNCATE & DELETE? Database triggers do not fire on TRUNCATE DELETE allows the filtered deletion. Deleted records can be rolled back or committed.Database triggers fire on DELETE. 4. Difference between procedure and function? 6. What is explicit and implicit cursor and examples? The implicit cursor is automatically declared by oracle every time an sql statement is executed whenever you issue a sql statement, the oracle server opens an area of memory in which the command is parsed and executed. Every implicit cursor attribute start with sql%. An explicit cursor is created and managed by the user. And used for multi row select statement. 8.What is a table, view, snapshot? Snapshot: A Snapshot is a recent copy of a table from database or in some cases ,a subset of rows/columns of a table. It is also known as Materialized view. 9.Do a view contain data? Ans: Provide an additional level of table security, by restricting access to a predetermined set of rows and columns of a table. 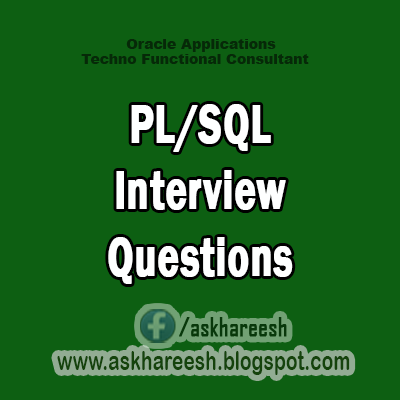 10.What is an Oracle sequence? Ans: A Sequence generates a serial list of unique numbers for numerical columns of a database's tables. Ans: A synonym is an alias for a table, view, sequence or program unit. 12.What are the types of synonyms? Ans: There are two types of synonyms private and public. 13.What is a private synonym? Ans: Only its owner can access a private synonym. 14.What is a public synonym? 15.What is an Oracle index? Ans: An index is an optional structure associated with a table to have direct access to rows, which can be created to increase the performance of data retrieval. Index can be created on one or more columns of a table. Index may also be considered as a ordered list of content of a column. Ans: The set of objects owned by user account is called the schema. 17.What is a join? Explain the different types of joins? Ans: Join is a query, which retrieves related columns or rows from multiple tables. Non-Equi Join - Joining two tables by not equating two common columns. 18.Difference between SUBSTR and INSTR? Ans: INSTR (String1, String2 (n, (m)), INSTR returns the position of the m-th occurrence of the string 2 in string1. The search begins from nth position of string1. 19.What is difference between CHAR and VARCHAR2? What is the maximum SIZE allowed for each type? 20.How to access the current value and next value from a sequence?